The copywriter pitch is Naughty Is Not An Option Christmas Catalog. That automatically limits the naughty vs nice alternatives. One would hope all are not naughty but but take no chances with your performance. Stay away from that nasty stuff regardless. 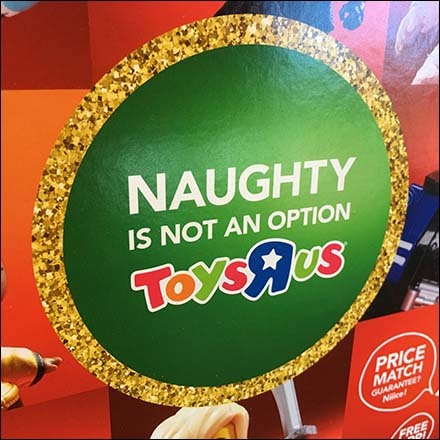 This corrugated temporary Naughty Is Not An Option Christmas Catalog displayer seen in the entry to Toys R Us. Consider various views in the gallery of images.